Back in the day, before the Richemont Group (then Vendôme) had acquired, or perhaps even heard of Panerai, the brand’s few models were simply curiosities of interest to two types of collectors: those who amass military watches and all-embracing Rolex aficionados. It was obscure if not quite unknown, and price guides from the mid-1980s show Panerais with the kind of values that would, today, stop your heart from beating. As in: You couldn’t give ‘em away. Panerai’s appeal for military watch collectors is obvious: Prior to 1993, they were made solely for assorted navies’ underwater teams, including the Italy’s and Germany’s saboteurs during WWII, while both the Egyptian and Israel forces — you gotta love the irony — commissioned Panerais in the 1950s. As for Rolex collectors being cognisant of the brand prior to 1993, the connection is Rolex’s involvement in the early case design and manufacture, with Rolex-marked, Cortebert-based movements used to power certain models. In 1993, when the brand was brought back to life under the aegis of Dino Zei, the production was severely limited, with only a handful of faithful-to-the-original Luminors and Marinas. Mainly Italian collectors were targeted, so it was by accident that Sylvester Stallone would learn of the brand and put it in the map. Oddly, Zei and Co also reissued a model that had never actually been produced because of wartime conditions, unlike the Luminors and Marinas. 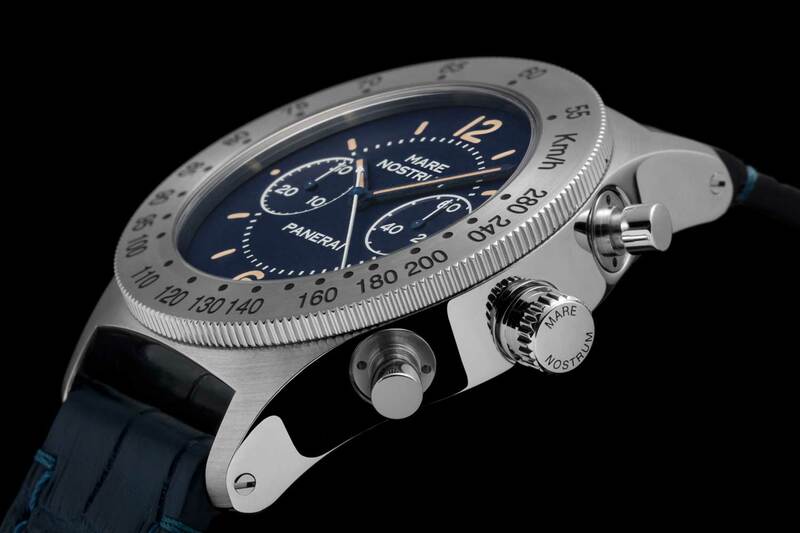 It was based on drawings in their files and used neither the Luminor nor the earlier Radiomir cases: The Mare Nostrum, the company’s first-ever chronograph. 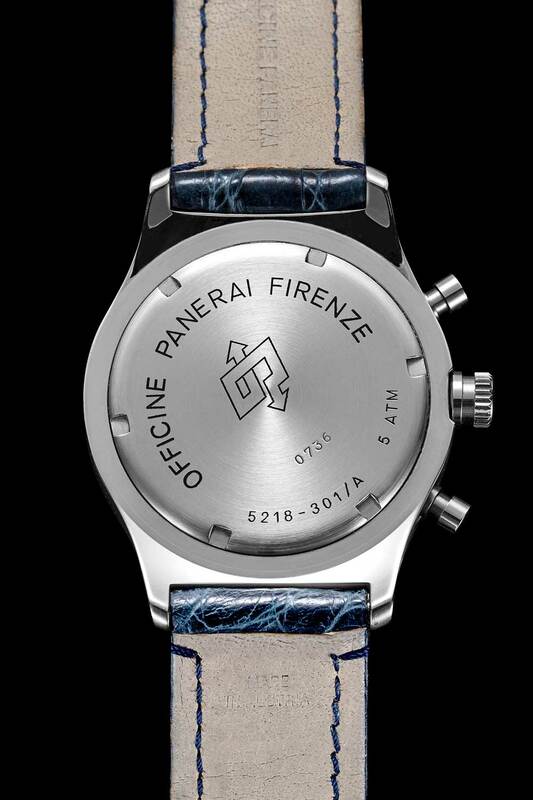 Panerai Firenze (as some call the pre-Richemont incarnation) created a 42mm facsimile of the drawings in their archives that survived the 1966 flood in Florence, given the identification of Ref. 5218-301/A. 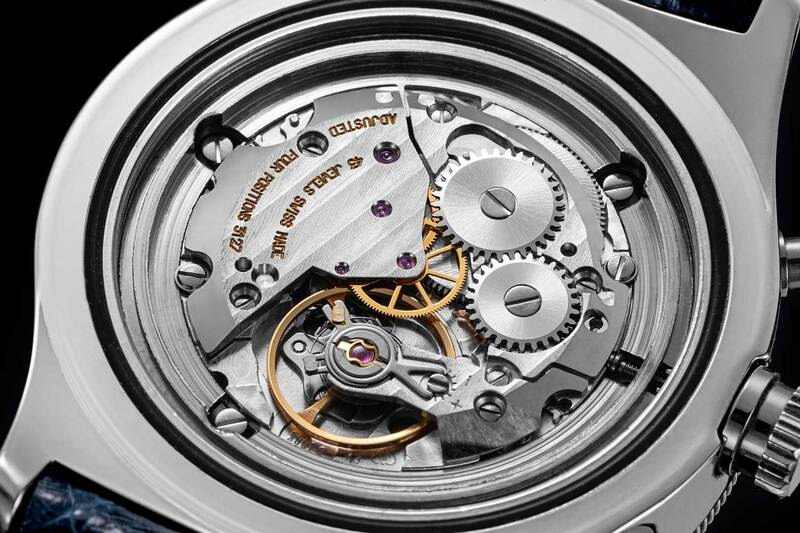 It was fitted with ETA 2801 movement and Dubois-Depraz module that looked the business: Two sub-dials, two pushers, chunky case, its raison d’être being a timepiece for deck officers. Despite serial numbers that suggest otherwise, it is believed that under 500 were actually produced, including all the variants. Richemont, which would also revive the Radiomir case during the transition after its 1997 purchase, produced black dial and white dial versions, some with smooth bezels and assorted, Sylvester Stallone-associated types with the Slytech identification on dial and caseback. The definitive (or should that be “standard”?) 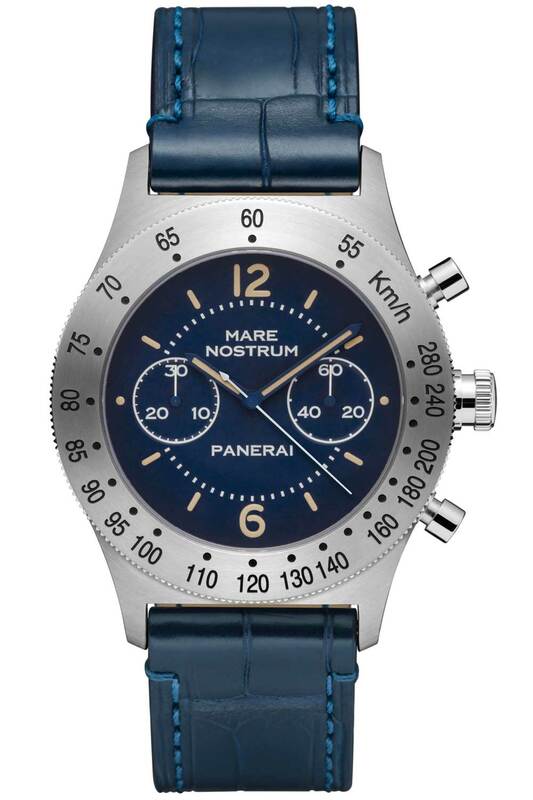 pre-Richemont Mare Nostrum, though, had a dark blue dial and engraved tachymeter bezel marked in kilometres. For most, the Mare Nostrum was a cul de sac, although prices started to climb simply because it was such an oddity. Eventually, however, an actual, working physical prototype emerged, made during wartime, which was acquired by the Panerai Museum. It negated the accuracy of the 1993 reimagining. For one thing, it was a massive 52mm in diameter. For another, it had a layered, “3D” dial. 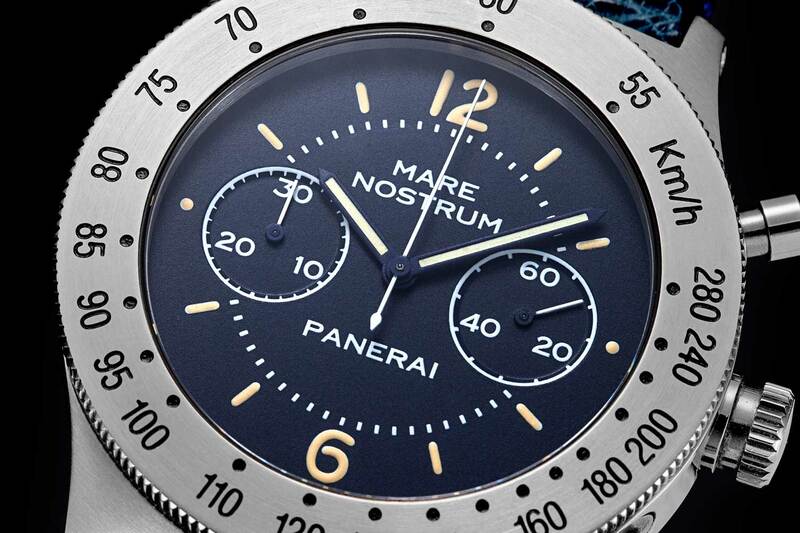 It was this design that Panerai followed precisely when, in 2010, the 52mm prototype Mare Nostrum was reborn as PAM300, in a, quickly sold-out, 99 examples. 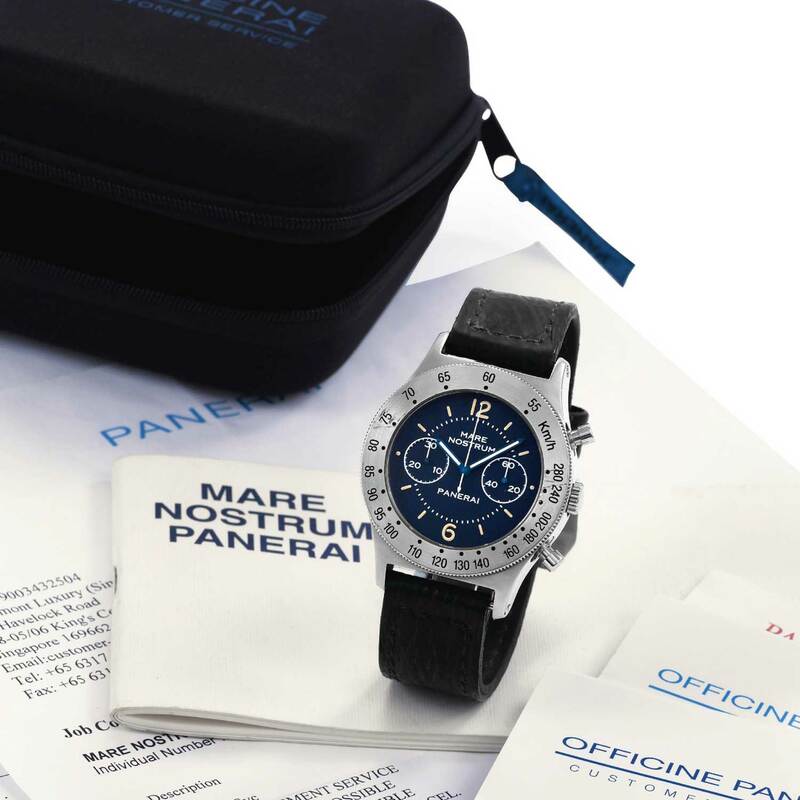 Five years later, Richemont returned to the Mare Nostrum, and addressed certain customers’ concerns that the massive PAM300 was simply too heavy to wear. They responded with another instant sell-out, the 52mm PAM603 Titanio, in 150 examples. But even that weight reduction still didn’t please those with less-than-Stallone-sized wrists. 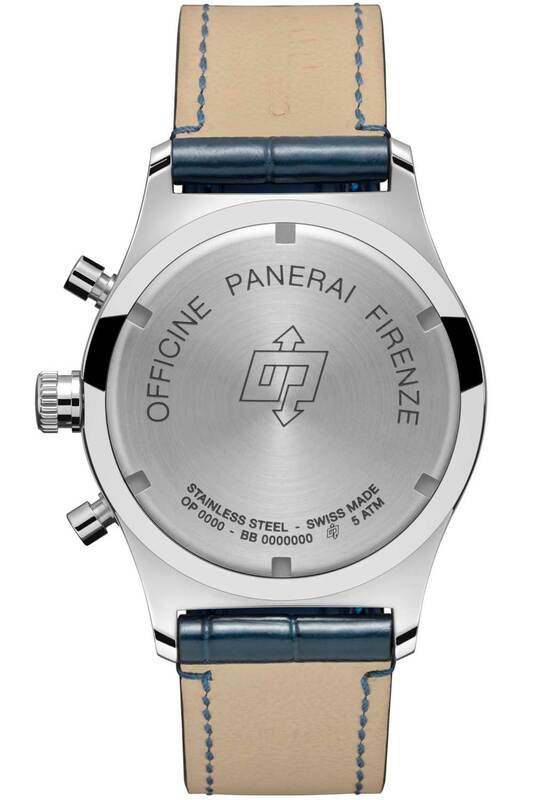 It was realised that — like the gigantic Egiziano reissue — even the most devoted of Paneristi found 52mm simply too big to wear. Now, in 2017, the company has released the Mare Nostrum Acciaio, in a AISI 316L stainless steel 42mm case and it is almost 100 per cent identical to the far-more-wearable 1993-1996 release, but there are minuscule differences. Side-by-side with the early version, the new Mare Nostrum Acciaio – 42mm (PAM00716) has deeper, darker etched markings on the bezel, the crown is inscribed with “Mare Nostrum” as opposed to plain, and the lugs appear slightly stouter. 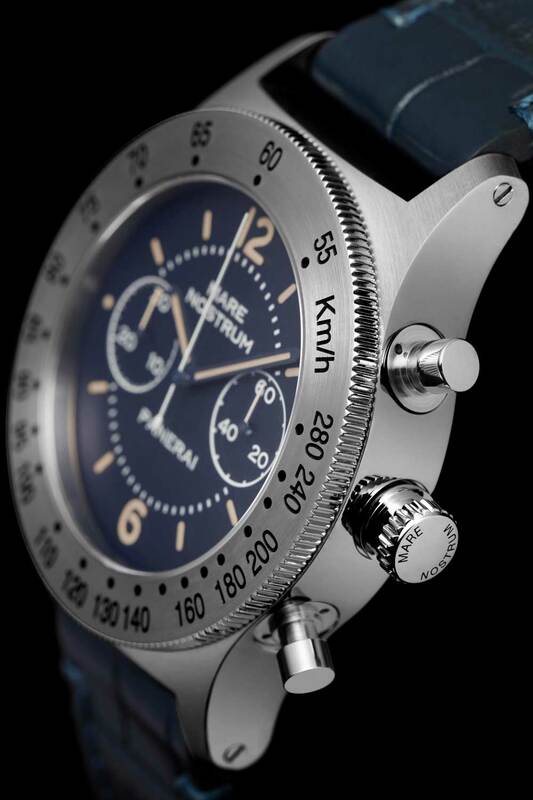 Beyond these picayune points, the dial of the new Mare Nostrum Acciaio – 42mm is the same deep blue as on the 1993 model. The chronograph minute counter is at 9 o’clock while the small seconds dial is at 3 o’clock and the chronograph seconds hand is centrally mounted. The engraving on the dial and the markers coated with beige Super-LumiNova®. Inside is the same movement as the pre-Vendôme model: the OP XXXIII calibre, created and personalised by Panerai on the ETA 2801-2 base with a Dubois-Dépraz chronograph module, but it is now C.O.S.C. certified. It was in Grimoldi Milano that I found mine, a watch store that I had been frequenting because of its wonderful selection of second-hand timepieces, and the collective knowledge of Anselmo Grimoldi and sons Cesare, Giorgio and Roberto. They had two “pre-owned” Panerais in stock, a Luminor Marina and a Mare Nostrum. I knew the former, but had never heard of the latter. I only had enough to acquire one. 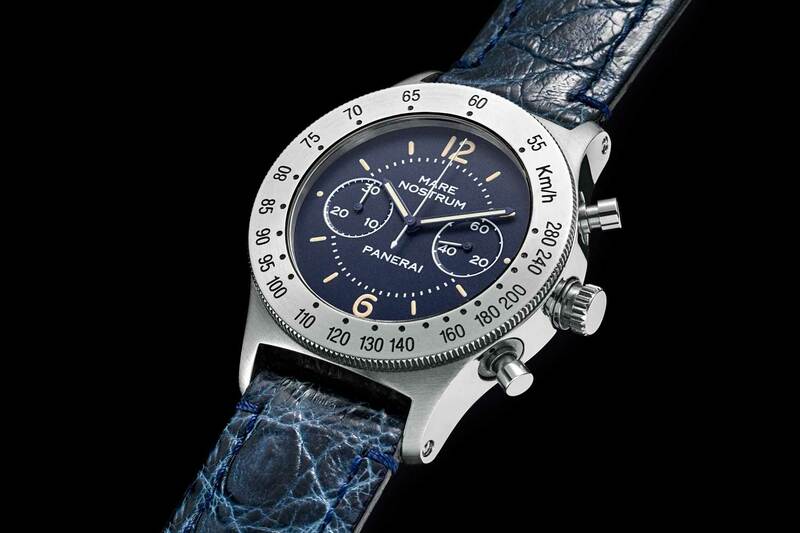 A little voice inside me said that the chronograph was going to be the rarer of the two. I haven’t regretted it in over 20 years, the best £900 I ever spent. 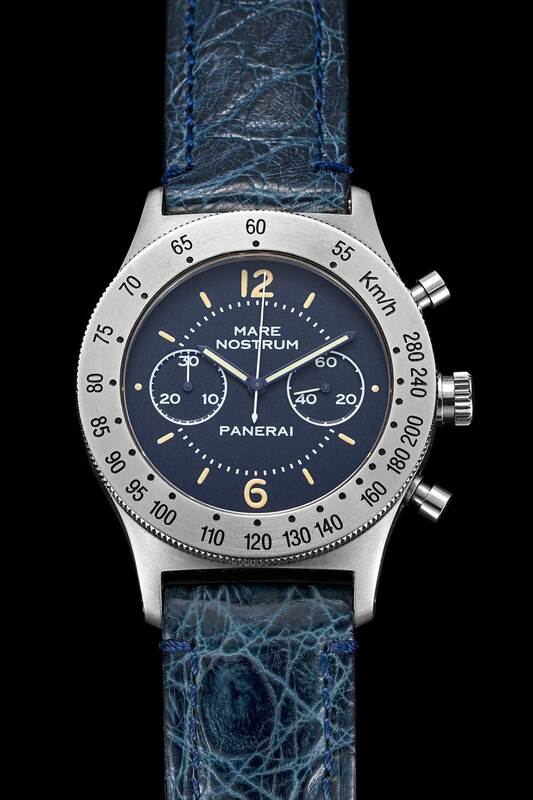 On a final note, I swiftly removed the hideous sharkskin strap supplied with the original Mare Nostrum and relegated it to its box, replacing it with a gorgeous blue alligator strap. 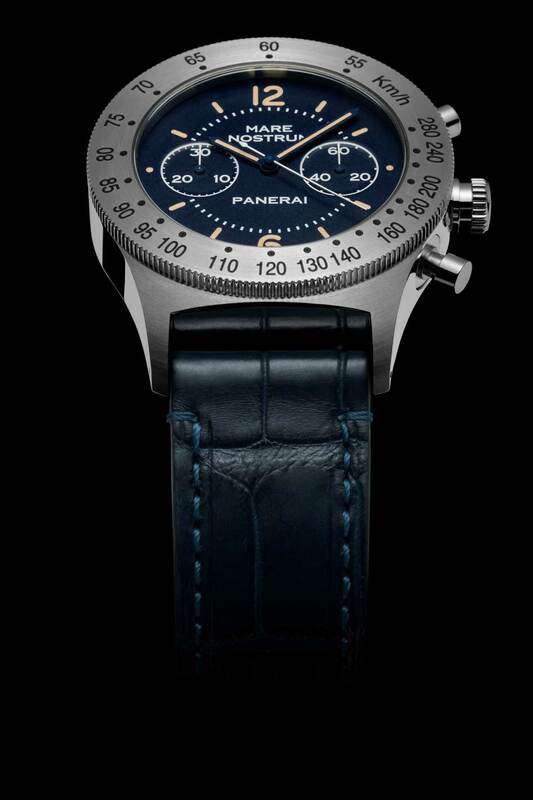 I see that Panerai has done the same. ‘Nuff said.